On Sunday and Monday it was in the mid 70s. Yesterday and today it did not get out of the 20s and there was some insane morning wind. Wow. I left Ohio to get out of this kind of weather. It looks like tomorrow will be just as cold, with a chance of little snowflakes Thursday night. To top it off Texas isn’t built for these temperatures and the energy grid can’t handle the load, giving us rolling black-outs and lots of school and business closings. Yes, I whine, I know. 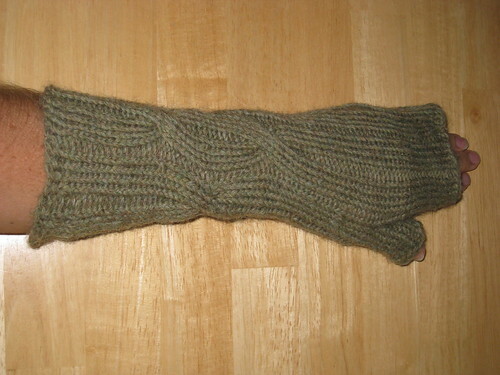 Anyhow this coldness reminds me of a gift I knitted for myself around a year ago. Arm warmers! They are one of my favorite shades of green. The intent was to wear them at my desk at work because my fingers sometimes turn purple from being cold. Unfortunately they make typing a bit difficult so I don’t wear them as often as I should since typing is pretty instrumental to my work. That does not detract from their appeal though. The pattern name is dashing and I found it on ravelry (of course). Pattern browsing on ravelry is addictive, you should sign up and try it. The pattern is available from knitty. The yarn I used is KnitPicks Wool of the Andes, a very nice and affordable yarn. 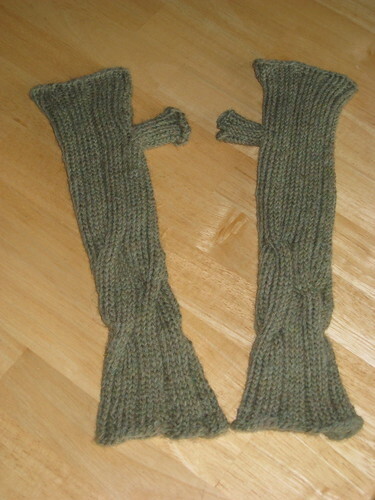 I really love the way the long cables turned out on these arm warmers. Overall I found this project to be pretty easy and would recommend it. It does require knitting in the round on double pointed needles, but once you learn how to do that this is a great pattern!